Thornhill Broome Beach Campground is in Point Mugu State Park and has 69 primitive campsites stretching for two miles along PCH and right next to the surf of the Pacific Ocean.Vault toilets are available and there are a few roadside spigots for drinking water at Thornhill Broome Beach Campground. There’s also a cold shower near campsite #47. The campground and beach are also pet-friendly. To make a reservation, click on the ‘Make A Reservation’ button and you’ll be directed to the reservation agency (Reserve California). Enter ‘Point Mugu State Park’ to inquire about Thornhill Broome campground reservations. Campsites 48-64 are seasonal sites (tent only) and are first-come, first-served. Check in is 2:00 p.m. and check out is 12:00 p.m. Arrive early to get in line for a first-come, first-serve campsite (especially in the summer and weekends). First-come first-serve campsites are not necessarily guaranteed for all of the nights you may like to stay. Your entry fee covers one vehicle and one legally towed in vehicle. There are additional fees for extra vehicles. You are to park only in your assigned campsite and wheels must remain on the pavement and within the parking space or limit line. Park additional vehicles in the day use lot. There is also a small overflow parking area north of the campground. The campsites are nothing more than parking spots along the highway and accommodate trailers and RVs up to 31 feet. Some will accommodate tents and you can pitch your tent right on the beach (sand). Each campsite also has a table and fire ring. A few have BBQ grills. All fires must be in the designated fire rings. Campsite occupancy is a maximum of eight people. Limit 30 days per calendar year. Sycamore Canyon campground is another option located in Point Mugu State Park. 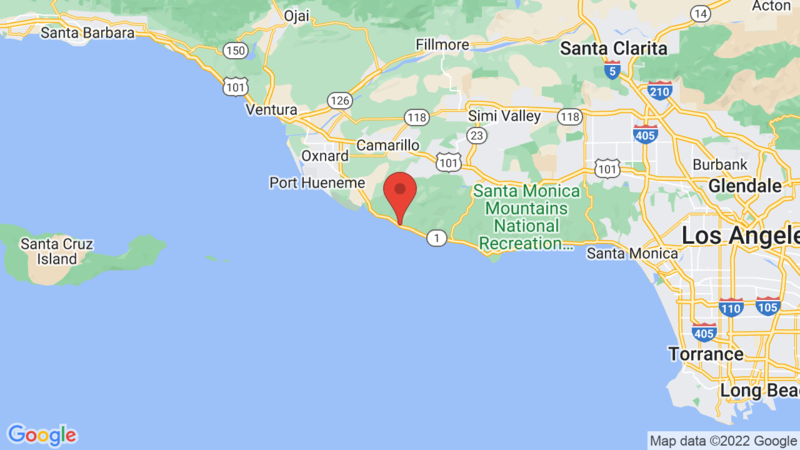 Point Mugu State Park is located on Highway One up the road from Malibu and features 5 miles of ocean shoreline and 70 miles of hiking trails along the beach and in the Santa Monica mountains. You’ll find rocky ocean bluffs, sandy beaches, rugged hills, two river canyons, grassy valleys and even the jagged pinnacles of the Boney Mountains State Wilderness area. Outdoor recreation includes surf fishing, swimming, beach combing, ocean kayaking, skin diving, scuba diving, horseback riding, hiking, biking, whale watching, wildlife viewing and for the adventurous – sunbathing. Visted Thornhill Broome Campground lately? We'd love to hear about your adventure. Did you find us useful? Did we forget something? Anything our community should know before heading out to Thornhill Broome? Hi Christine, You can make reservations at Thornhill Broome campground (Point Mugu State Park). Click HERE to go to the ReserveCalifornia reservation page. Is it possible to get first come first serve? The reservation site only lists 40 something sites out of 69 and the weekend I am looking at is booked. Thank you! Good question Lizzie. There are 29 that are first-come, first-serve, but getting one will depend on when you arrive. If shooting for a weekend, you should probably try for a Thursday arrival. Summer is pretty busy. What time do you recommend being there for first come first serve? We want to go on a weekday on Wednesday and stay for two nights. Please let me know, thank you! That’s a good question Tony! Mid week is your best best for getting a first-come, first-serve campsite at Thornhill Broome. Prior to Memorial Day you should not have a problem, but the summer will be competitive. Check out is noon, so I’d recommend showing up no later than mid-morning during the summer/busy time to try and get a spot. Good luck! Hello, looking for camping in large Rv on Thursday, Friday, and Saturday night. Any chance of getting a first come spot? Hard to say, but arriving on Thursday should improve your chances greatly of getting a first-come first-serve campsite. Best of luck! Check in time at Thornhill Broome campground is 2:00 P.M. Hope you have a great time! Is sycamore camp ground first come first serve? HI Trevor, other than the hike/bike campsites, all of the other campsites are on the reservation system (ReserveCalifornia). Campsites are assigned at check in. Due to some scheduling changes, it’s looking like our group will have 2 extra cars now coming at different times. Is there other overnight parking anywhere or what would you suggest? I don’t want to book an extra campsite when we don’t need it. There is a small overflow parking area north of Thornhill Broome campground. Parking is limited for campers with extra vehicles. Oh and one more question: do the first come first serve have fire rings? There are fire rings at each campsite at Thornhill Broome campground. We are not aware of any other (first-come, first-serve) fire rings on the beach. Hi! I just tried to get first come first serve at Thornhill for the weekend and they told me it’s night by night and if we do get a spot we would have to move if it was reserved. I’m confused because I’m under the assumption there are 29 spots you cannot reserve and do walk ups. That’s too bad! That was our impression too – that there were a designated # of first-come first-serve campsites and if you got one you could stay there. We will be sure to put there ‘policy’ up on the Thorhill Broome campground page. How can we get a tent campsite at Thornhill Broom? I’ve only seen what looks like trailer sites when booking online. Thanks! If there is sand in front of your campsite – you can pitch your tent right on the beach (sand) at Thornhill Broome campground. Thank you! I just booked my stay for August! You’re welcome – hope you have a great time! Why is it every time I put in Thornhill Broome for a reservation, it comes up “not found”? I don’t wish to camp in Big Basin but that is the only option? Unfortunately Reserve California does have some issues with its reservation system. Try clicking HERE and enter ‘Point Mugu State Park’. That may help find Thornhill Broome campground reservations. I know there are sometime fire restrictions at Malibu Creek State Park camping. Are there any fire restrictions at thornhill-broome? Can we cook with charcoal? Thornhill Broome campground does take reservations, but there are also a few first-come, first-serve campsites. However during the summer the first-come, first-serve campsites are very difficult to get. You can visit the Thornhill Broome campground page and then click on the ‘Make A Reservation’ button to check availability and make a reservation. Which campsites are for tents and how do I know I’m getting a tent site when making a reservation? Are small dogs allowed on this beach? Thanks! Thornhill Broome State Park campground and beach are pet-friendly. Dogs on a leash are allowed in the Park’s day use areas, campgrounds and beaches. Click on the ‘Make A Reservation’ button on the Thornhill Broome campground page to check availability and make a reservation. This routes you to ReserveCalifornia and it should indicate which are tent only sites at Thorhill Broome. Every single time I try to make a reservation the website does not allow me to find thornhill!!! I live in the area and have been trying to camp here for over a year now, but can never seem to figure out these confusing websites with links to OTHER camp sites when I’m trying to stay at THIS ONE. After clicking on the ‘Make A Reservation’ button from the Thornhill Broome campground page, you’ll be directed to ReserveCalifornia. From there, search ‘Point Mugu State Park’. Which site numbers are tent only? Unfortunately we don’t know which campsites at Thornhill Broome campground accommodate tents, but most sites do allow tent camping. What time is best to get to the camp site to see if first come first serve is available for that day? Usually during the summer it’s pretty competitive to get first-come, first-serve campsites at Thornhill Broome campground. Check in is 2pm and check out is noon. You’ll generally have people getting in line (especially on Thursday and Friday) by 7AM. Some will be waiting for first-come-first serve sites, others will be hoping for people (with reservations) leaving early or not showing. Is there a charge to use the Sycamore Canyon dump station and/or showers if you are staying at the Thornhill Broome campsite? Thank you! Yes Thornhill Broome registered campers can use the RV dump station and showers at Sycamore Canyon campground. I am looking to camp September 22 to the 24th for my birthday. I seem to be having a problem reserving a spot at Thornhill Broome. What is the best way to secure a site? From the Thornhill Broome campground page, click on the the ‘Make A Reservation’ button to be be directed to the reservation agency (Reserve California). Once there, enter ‘Point Mugu State Park’ to inquire about Thornhill Broome campground reservations. Hope this helps! I have a reservation on 9/14/18. Can I arrive before check in (2pm)? Also, will i need sand bags? I heard it gets pretty windy. Also, do campsites have parking spots at each campsite? Most California State Parks won’t allow early check-in, but Thornhill Broome campground may let you check in early if your site is available. I would recommend checking the weather for (wind) conditions. On your date of arrival the wind is expected to reach 22-24mph, so sand bags would probably be a good idea. Also, each campsite has a parking area at Thornhill Broome campground. How many cars can fit in one site? For Thornhill Broome campground – your entry fee covers one vehicle and one legally towed in vehicle. There are additional fees for extra vehicles. You are to park only in your assigned campsite and wheels must remain on the pavement and within the parking space or limit line. Park additional vehicles in the day use lot. Most of the campsites have a fairly large parking area (up to 31 feet) so you can fit two cards, but you’ll need to pay extra for the 2nd vehicle. We use our suv to tow our pop-up camper. The suv is 17′ long and the pop-up is 22′ when opened. That’s over the 31′ parking space. Can we park side by side in the space? Thank you! You won’t be able to park your vehicle and trailer side-by-side at Thornhill Broome State Beach campground, but both should fit in most sites. The campground host will make the final call though and can assist in finding a site that fits for you. Hello! I’m planning on showing up at 5am on saturday the 13th to try to get three first come first serve campsites. I’m a little nervous because online reservations are booked. Is there a chance at getting at least 2-3 sites on that day? Fingers crossed. CampsitePhotos.com is not associated with the campgrounds listed on our site. We provide the photos of each campsite, campground info and links to make reservations. Thornhill Broome campground is popular during the weekends, but usually there are a few open for first-come, first-serve. However, arriving on Saturday may be tough – even arriving at 5am. Most usually arrive Friday to try and get the open spots. Best of luck! Hi. Is there car camping? Or do you have to park separate from your space of the table and fire pit? Yes, there is car camping at Thornhill Broome campground. You just need to do it in your campsite. Is there enough room for two tents on the campsites? That depends on the campsite. Most campsites can accommodate two tents at Thornhill Broome campground. If I am trying to come Sunday, Dec 2, will I be okay for first-come first-serve spots? Will I have to be there early or will there most likely be spots open at around 7pm? You should not have a problem finding a campsite – arriving late Sunday (Dec 2) at Thornhill Broome campground. There are several campsites at Thornhill Broome campground that will accommodate your 40 foot RV. December 24 for 5 days should be available (first come, first-served), but you may want to check on reserving a site to be safe. Go to the Thornhill Broome campground page and click on the ‘Make A Resevation’ button to check availability, pricing and to make a reservation. When will spots open up for Reservation in August 2019? Thornhill Broome campground reservations open up 6 months prior to the day of arrival. So for example if you were wanting to arrive on August 1, then the first day you could try and get a reservation is on February 1. February 10 would be when reservations open up for August 10, and so forth. Reservations open at 8AM PST. We recommend you are logged in to ReserveCalifornia and the campground loaded and ready to go (to choose a site) before 8AM. Campsites will booked up quickly and the campground will probably sell out within a minute (or less) past 8AM. So Seasonal Campsite @ Thornhill 48-64, are they the first come first serve tent sites? If not, how can i reserve one of the spots in that section? As far as we can tell campsites 48-64 are seasonal sites (tent only) and are first-come, first-served. Is there a tent size max? also what is the exact dimension of each camp spot? Unfortunately we did not measure the campsites at Thornhill Broome campground so we don’t have the exact dimensions of each camping spot. Looking forward to arriving this weekend. Heard there might be a problem with vehicles turning at end of road? Is road serviceable at end to turn around with trailers? Can you tell me where the nearest grocery store for supplies is located? Also, are there any roadside spigots available for water? Thanks! The nearest grocery store to Thornhill Broome State Beach campground is 11 miles north in Oxnard, or 12.2 miles south in Malibu. Thornhill Broome State Beach campground also has drinking water / spigots. Hi. We are reserving a spot for tent camping. Do you have little bbq pits? And do you have fire pits so we can bring wood to have a little fire? At Thorhill Broome campground – each campsite has a table and fire ring. A few have BBQ grills. All fires must be in the designated fire rings. There are also a few community fire rings on the beach. The best was is to check the ReserveCalifornia.com site a few times a week (or more) for cancelations at Pt. Mugu State Park – Thornhill Broome. However – later this year CampsitePhotos.com will role out a new program that will help people get notifications as soon as there are cancelations at campgrounds. It’s going to be a really great tool to help people get a canceled campsite. when I can make a reservation for October? Thornhill Broome, and all California State Park campgrounds, are on a 6-month reservation window system. You can make a reservation exactly 6 months prior to the day of your arrival. For example, if you want to arrive on October 6, then the first day you can make a reservation would be on April 6. Be sure to login to ReserveCalifornia around 7:30 am and have the campground selected. The reservation window will open at 8am PDT. Your RV should fit fine, but the on-site camp host will make the final call.